Members of LTU’s women’s basketball team stopped by Comerica Park during their walk to raise money for breast cancer research. Left to right are Jackie Hood, Allison Bicknell, Danyel Strauss, Erin Cater, Jazmine Brown, Jill Carland, Jena Repichowski, Hali Butler, Karlie Dieck and Brenda Davis. The Lawrence Technological University Women’s Basketball Team joined thousands of participants in the annual Making Strides Breast Cancer Walk in downtown Detroit on Oct. 13. The walk raised $483,870. The Lady Blue Devils wore pink in proud support of the fight against breast cancer while walking with survivors and helping to raise awareness against this disease that affects one in eight women. These fund-raising walks have helped saved more than four million women in this country. 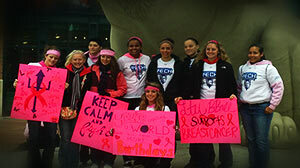 “It was awesome to walk for such a great cause and show others they are supported,” said team captain Jackie Hood. “I appreciated all the effort our girls put into the signs and to get people excited about the walk. It shows they understand the value of supporting our community and the value of the cause,” said Head Coach Mary Pinkowski. The LTU participants are members of the university’s first women’s basketball team, which opens its season on Nov. 2 and hosts its first home game on Nov. 8. Lawrence Tech is a member of the National Association of Intercollegiate Athletics and competes in the Wolverine Hoosier Athletic Conference.